Yeah, it's been a while. Work+life = no time for fun stuff like this. In this week's post we cover everything from parade confetti and geek TV shows to online schools and police raids. "What self respecting geek doesn't go home to be pampered by Mom?" "Don't you mean 'go upstairs' ?" 1. The Scifi angle - The concept behind the story is that people can be implanted with a chip to interface their brains with the internet. At first glance the ability to access any information anywhere may seem like a good idea but, as with any other internet connected system, the inevitable happens: a virus spreads and kills 1/3 of the world's population virtually overnight. This reminds me of Ghost in the Shell, another series I never had the time to fully appreciate. Setting aside the apocalyptic theme for a moment, the story of how this was developed and sold to the public would make for a great piece as well. How would you convince people that the system was secure? Wouldn't people be wary of the devices? The possibilities are endless. 2. The direct distribution angle - This series was developed and produced by people that are no strangers to Hollywood and the entertainment industry (The director previous was attached to an X-Men movie) yet they chose to do this on a low budget (shooting in just 29 days) and release it as a web series. Perhaps they pitched it to some TV execs and were turned down? More likely this was done in their spare time as something fun to do and build their resume. Netflix and other online distributors are already producing properties that will never touch a traditional cable or satellite. When you are not bogged down with a studio or media corporation breathing down your neck the creative process can be much more free. At any rate it will be interesting to see where this goes. The trailer looks really cool. This one is close to my heart. As a pre-teen I spent (wasted) a lot of money playing video games in arcades, amusement parks, and convenience stores. I have a special place in my heart for Super Mario, Pac-Man, and Gallaga. One of my fondest memories as a young child was playing Joust and Night Driver (the really old sit-in version) at a now defunct bowling alley near my Grandmother's house. A good friend of mine from high school is into collecting and restoring these old arcade games, which he does as a side project. PBS even did a documentary about it not long ago. These old electronics are in danger of going away completely. As time goes by the plastic components degrade and eventually the circuit boards fail. The cool part is that you can buy really small devices to plug into your TV to emulate just about any old arcade game but the experience may fall flat. 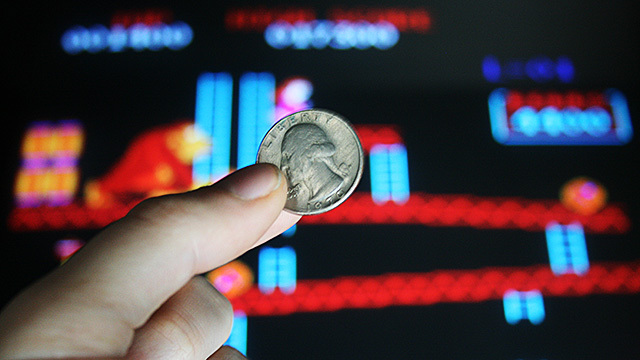 Nothing can compare to the old style way of standing in line with your quarter lined up on the machine to mark your place. For some serious 80's nostaglia, check out the book "Ready Player One". I like the fact that RIM is taking a proactive approach and simply disallowing the most common passwords, forcing you to choose something a little less common. But this is chasing your tail: when you stamp out the 100 most common passwords they are replaced by the next 100 most common passwords. Users want ease of use and if you allow non-complex passwords in your app your users will use them. Ultimately this process will lead to the banning of the entire dictionary of single words. What's next, moving on to banning word combinations? Hint: many of the currently banned 106 passwords are more-than-one-word or letter/number combinations. In the end, all it takes to be secure is a haystack. Read that quote again. They can crack ANY Windows XP password that was hashed using the LM hash in under 6 minutes (XP has a 14 character limit on passwords). They used off-the-shelf components that are easy to acquire, along with an open-source HPC platform to create a monster password cracking platform. This attack does mean that the attacker must have access to the actual password hash, which requires OS access, so the actual threat your typical user is low, but an attacker with physical access to a machine can easily take it over without changing any passwords. They can read the local admin password hash using some common tools, look it up in a hash table, and now they have root access. The writing is on the wall: passwords are not secure. The technology to crack passwords is gaining ground. How long until we hear about someone who used AWS or Windows Azure, with a stolen credit card, to create a password cracking cloud service? We need something much more secure: multi-factor auth seems to be a possible alternative (something you know + something you have). A 9-year-old girl (in Finland?) has her own laptop. She searches for songs on Google by a popular Finnish band, Chisu. Goog pointed her to links on The Pirate Bay. She clicks the links but the downloads failed. Her father takes her to a store and they buy the CD. One of the ISPs involved in her online activity (not clear if it was her residential ISP) flagged her activity. The ISP reported it to the Copyright Information and Anti-Piracy Centre (CIAPC), a non-profit anti-piracy organization. CIAPC contacted the family and demanded they pay a 600 Euro fine and sign an NDA. The father declines the offer. Police raid the home, confiscating the laptop and other items as evidence in the case. The exact details are still fuzzy and it will take some time to clear all the legal facts in the case. For a moment we will assume all the alleged items above are true. Can a 9-year-old be held liable for not fully understanding copyright law online? Can you be legally liable for entering a search term on a search engine and then clicking on a link? What should be the legal or civil penalty if that link is not from a valid source? In the case of a simple infringement, even in the case where there IS infringement, was a police raid an appropriate response? The researchers found that shutting down Megaupload had a negative effect on some box office returns. It did NOT have a positive effect in any case. That seems to follow the argument that pirates actually spend more money than the amount that they supposedly pirate. Disclaimer and clarification: I do NOT endorse the stealing of intellectual property but I am most definitely FOR loosening digital copyright rules. This is a losing battle on all sides. I'm not sure there is a perfect answer but it is certainly not the situation we have now. Of course Macys, NYPD, and Nassau County authorities (where the documents apparently originated) said they were investigating how such documents made it NYC to be used in the parade. Macys even said they used only commercially produced, multi-colored confetti and does not use shredded paper. The moral of the story: EVERY company/organization that handles sensitive info MUST have a well-defined, trustworthy, and audited document retention and destruction policy. If not you are asking for trouble. Online learning has come a long way. I took some online college courses in '06 and hated the experience. In the past year I have taken courses from Khan Academy, codeacademy.com (along with my 10-year-old son). Their user interfaces are incredibly easy to use. Even my kids love it because they make learning fun and easy. Isn't that what makes a good teacher in a real school? Brick and mortar schools are in for some serious competition. And, yes, competition is a good thing.